After a week off to announce the Sports Time Radio All Stars, we’re back. I’m a little disappointed that baseball hasn’t gotten more attention on the highlight shows. For whatever reason there seems to be a lot of NBA talk, even though Dwight Howard signed a week ago with the Houston Rockets. While I enjoy the NBA I don’t need to see more highlights from your summer league games than I do from an actual baseball that counts in the standings. I’ll take most of the blame for this as I don’t have the MLB network on my cable package. I guess if I want my baseball highlights I’ll have to breakdown and upgrade my cable package but like almost everyone else out their I’m not looking forward to spending the extra money. Did you vote for the last spot on the All Star team? I always vote once and I cast my vote for Joaquin Benoit (Detroit Tigers) in the American League and Yasiel Puig (Los Angles Dodgers) in the National League. Out of the ten (10) guys that where on the ballot these where the two (2) players I wanted to see. 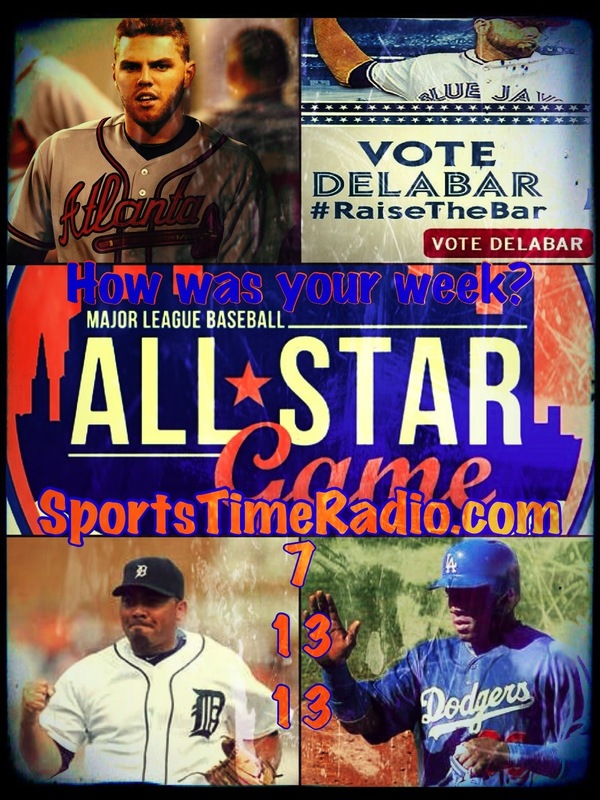 Of course I didn’t get my wish as Steve Delabar (Toronto Blue Jays) & Freddie Freeman (Atlanta Braves) won the fan voting. The Toronto fans and the Atlanta fans teamed up to vote for each others players and I know there was some issue with this. Dan the Man pointed out on the show that the San Francisco Giants had a team they partnered with, but right now I’m drawing a blank on who that team was. It was a promotion to get you to vote for each others players. This isn’t a big an issue to me as it is to some experts; it’s the All Star game and you’re allowed to vote for whoever on the ballot you want to vote for. Ilya Kovalchuk walked away from the NHL and a contract that would’ve paid him $77 million. Kovalchuk is from Russia and more or less just wanted to go home. He made $23 million on the contract before leaving and I’m guessing will play in the Kontinental Hockey League (KHL) next season. A lot of people have called Kovalchuk out for doing this but I don’t see an issue with this. If Kovalchuk wanted to go home and play hockey he should be allowed to be. The New Jersey Devils don’t have to pay off the contract and I don’t believe it will count against their salary cap. While the Devils have to replace Kovalchuk I think they would rather replace him than deal with an unhappy player.